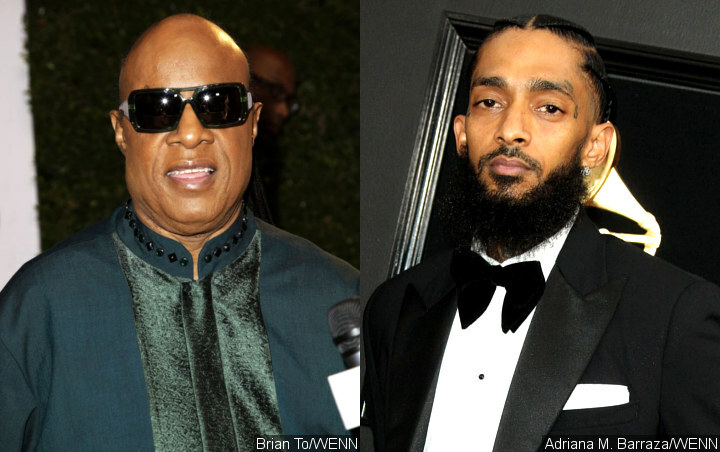 Stevie Wonder used his tribute appearance at Nipsey Hussle‘s Los Angeles memorial to call for stricter gun laws as he mourned the tragic rapper’s “unnecessary” death. Before launching into his performance, Stevie recalled having the “pleasure” of once meeting Nipsey, who he remembered as “such a great young man,” and expressed his grief at losing him to gun violence at just 33. Stevie shared his hope that lawmakers would take a stand to “make it so very hard for people to have guns and to take their frustrations out to kill life (sic),” citing Nipsey’s own anti-violence activism as motivation. “I hope that we don’t just talk about it, but we be about it to make a difference for our future,” he added. Wonder went on to perform his song “Rocket Love”, one of Nipsey’s personal favourites, and a cover of Eric Clapton‘s “Tears in Heaven”. His appearance would have been a dream come true for the slain star, real name Ermias Asghedom, as he once rapped about Wonder performing at his memorial in the track “Ocean Views”. Meanwhile, Snoop Dogg delivered a heartfelt tribute to his “friend” and “brother” at the Celebration of Life event, recalling the first time they met and reminiscing about the “special” bond they had shared. “I’m tryna stay strong for the homeboy Nip,” the emotional hip-hop icon told fans. There were also touching speeches delivered by Nipsey’s mother, father, kids, and other relatives, as well as his longtime girlfriend, model and actress Lauren London, the mother of his two-year-old son Kross. “I’ve never felt this type of pain before…,” she shared, as she celebrated the love of her life and his “majestic” soul and “brilliant” mind. “I’m so honoured and blessed that I got to experience this man,” she gushed, before addressing her fellow Los Angeles natives. A 25-mile procession past the rap star’s Marathon Clothing company in Hyde Park, where Nipsey was shot on March 31, and his childhood home in Crenshaw is currently underway as the tragic rapper’s remains are transported to a funeral home.